Shopping for SMS? Make Sure these Boxes are Checked. Are your recruiting efforts running dry? There are a few ways you can utilize social media to look more polished and branded online. This strategy will help allocate candidates through a different approach, building interest through company culture and behind the scenes content. Catch it all in this post! Are your recruiting efforts running dry? There are a few ways you can utilize social media to look more polished and branded online. Using a technology platform to find qualified candidates weeds out the less innovative and tech savvy bunch that might otherwise apply for your jobs. Those who use social media are typically more aware of emerging trends in business and technology, and let's be honest... those are the people you want to hire! There's no better way to reassure interested candidates that your company is a great place to work than current employees posting job openings. By having a personal connection post a job, this encourages people to look into it more by asking questions and getting more information. Employees can certainly provide an authentic inside look into what daily life looks like at a particular company, and that kind of insight can be incredibly valuable to candidates. Use a hashtag that follows you around the web, providing interested candidates an easy way to follow your company on all social platforms. Attach it to everything; every tweet, Facebook post, Instagram update, graphic, you name it. We've been rocking #AskYtel for a few years and it's been pretty powerful to watch our social footprint grow around the web and interact with followers who recognize our brand online. If you use job boards like ZipRecruiter or Indeed, there's often an integration where you can connect a social profile to your company page, so candidates can see your Instagram, Twitter, and Facebook page as soon as they land on your business page. Utilize this tool as one more way to cultivate positive brand exposure for your company for those who are job hunting. Use your time wisely by staying focused. Don't use this time to update statuses, change profile photos, etc. How does your business use social media to recruit awesome candidates for your company? 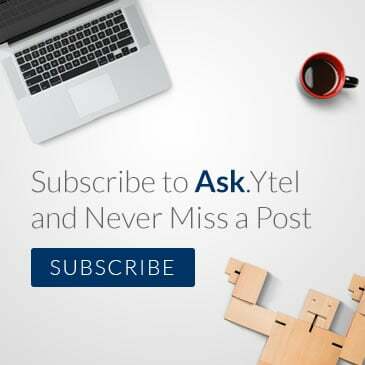 Share with us in the comments or tweet us @AskYtel! Subscribe now to receive relevant and informative content to your inbox! Sean leads the People, Culture, and Partnership efforts at Ytel. After almost 5 years of agency recruiting, Sean decided to move into an internal recruiting role, where he could have more of a direct effect on growth and people’s lives That’s when he met Ytel and the rest is history. Sean is a huge believer in culture, and puts an emphasis on people and building relationships.